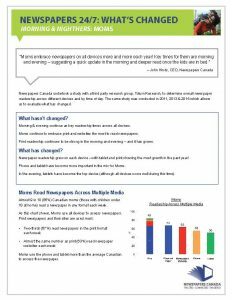 Newspapers Canada undertook a study with a third party research group, Totum Research, to determine overall newspaper readership across different devices and by time of day. The same study was conducted in 2011, 2013 and 2014 which allows us to evaluate what has changed. Morning and evening continue as key readership times across all devices. 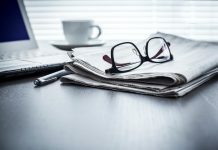 Moms continue to embrace print and websites the most to read newspapers. Print readership continues to be strong in the morning and evening—and it has grown. 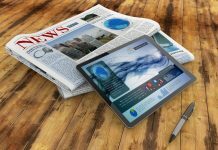 Newspaper readership grew on each device—with tablet and print showing the most growth in the past year! Phone and tablet have become more important in the mix for moms. In the evening, tablets have become the top device (although all devices score well during this time).